Affordable Dentures - Brook Park, Brian W. Redditt, DMD, Inc.
Brook Park, Ohio Affordable Dentures & Implants offers several styles of full dentures, each with special features and advantages. It’s part of our mission to put transformation within reach. See below for more details, or call us at 216-539-8994 if you have a question about a particular style. Getting new dentures or implants is a big step. But the right smile at the right price will change your life in a very positive way. 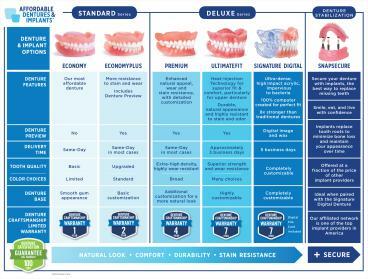 So take a minute to compare Affordable Dentures & Implants with the rest. We’re sure you’ll see why we’re part of a network of America’s largest providers of dentures, implants and extractions. And we’re happy to be serving Cleveland, Elyria, Parma, North Olmsted, Lakewood, Sandusky, Brunswick, Medina, Bedford and surrounding communities. Simply bring your military ID or proof of service (or spouses' ID or proof of service) with you to redeem your 10% discount. To learn more about this practice, see the information below. Brian W. Redditt, DMD, FICOI, FAAIP, is a general dentist and the practice owner of this Affordable Dentures & Implants-affiliated practice in Brook Park, OH. The practice opened on September 11, 2014. Dr. Redditt and his staff look forward to fulfilling the denture needs of patients who travel from Cleveland, Elyria, Parma, North Olmsted, Lakewood, Sandusky, Brunswick, Medina, Bedford and surrounding communities. Dr. Redditt earned his Doctor of Dental Medicine degree from Case Western Reserve University School of Dental Medicine in Cleveland, OH. 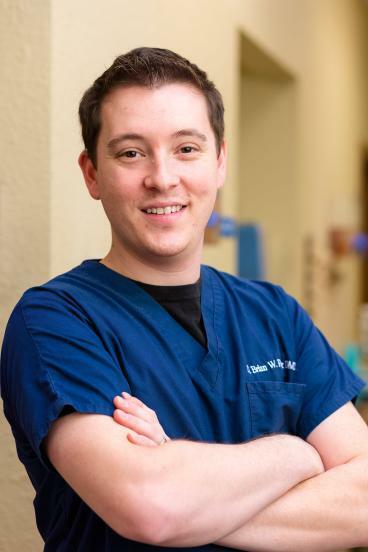 Based on many years of valuable dental experience, Dr. Redditt and his staff are proud to offer professional, compassionate care to patients that visit this practice. Dr. Redditt�s dental center has an on-site dental lab that fabricates new dentures and provides repairs and relines, often with same-day service. Being able to provide dentures in a day is a significant advantage, especially for patients who have traveled far distances to visit the practice. The on-site lab also eliminates the need to use outside commercial labs, which helps keep our fees low. Our highly skilled lab technicians have crafted thousands of dentures. Their training and experience are assets to Dr. Redditt�s practice and give you the confidence that your denture is being fabricated locally in Brook Park. Brian W. Redditt, DMD, FICOI, FAAIP, is a general dentist and the practice owner of this Affordable Dentures & Implants-affiliated practice in Brook Park, OH. 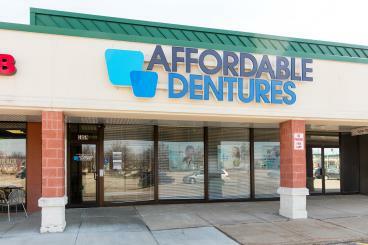 Affordable Dentures of Brook Park, Ohio is conveniently located in the Brookgate Shopping Center. 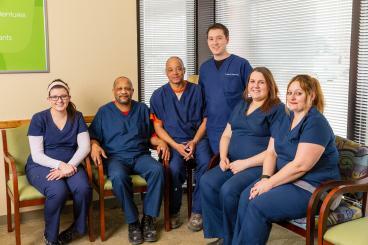 Our dental center has an on-site dental lab that fabricates new dentures and implants, often with same-day service. Dr. Redditt and his staff look forward to fulfilling the denture and implant needs of patients who travel from Cleveland, Elyria, Parma, North Olmsted, Lakewood, Sandusky, Brunswick, Medina, Bedford and surrounding communities. 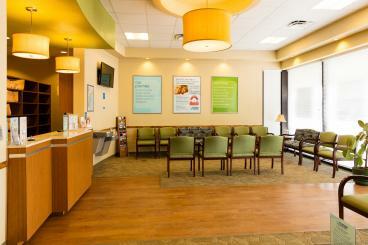 The lobby of Affordable Dentures & Implants office located in Brook Park, OH. Please fill out the form below to request an appointment. For immediate assistance, please call us at 216-539-8994.